Pauling, Ava Helen, and their three youngest children spent the first half of 1948 in England, where Linus was to serve a six-month stint as Eastman Professor at Oxford. It was a memorable visit for everyone in the family. The children attended British schools, Ava Helen entertained, and Pauling received wide acclaim for his lecturing abilities. His formal lecture at the Royal Institution in London, attended by many of the city's leading scientists, was a sensation. The British Chemical Society sent him on a tour of the country, where he impressed enthusiastic crowds with his humorous, entertaining, seemingly off-the-cuff insights into chemistry. His focus was now firmly on proteins. Most of his talks described the challenges of studying the structure of large biological molecules and with his ideas about the role of complementarity in their functioning. Beneath the theorizing remained the more basic problem of describing precisely how proteins were built, atom by atom. In the back of Pauling's mind was always the structure of keratin, the protein substance of hair and horn, the molecule whose detailed structure had so far eluded Pauling and every other researcher who had tried to crack it. Astbury's X-ray work had shown that it was a long-chain molecule with a structure that somehow repeated itself every 510 picometers (a picometer is one-trillionth of a meter; for comparison, 100 picometers is roughly the distance between a hydrogen atom and an oxygen atom in a water molecule). That repeat, the English initially thought, indicated that keratin's structure sort of zigzagged every 510 picometers, like a kinked ribbon. During his time in London, however, Pauling began to hear about another possibility. Instead of a flat ribbon, some British researchers were saying, keratin might have a structure more like a bedspring, with 510 picometers between each level. Sometimes they called this shape a spiral. But the most appropriate name was the one that eventually stuck: a helix. Pauling was familiar with the idea. In the 1930s a spiral-staircase form had been proposed for starches, and in 1943 a researcher Pauling had worked with, Maurice Huggins, theorized that a similar shape might be important for proteins. Huggins thought that hydrogen bonds between each turn of the helix might help hold it in place. "It was well known that any chain with identical repeating links that fold so that every link is folded in exactly the same way, and with the same relationships to its close neighbors, will form a helix," is how Francis Crick, then a graduate student, put it. 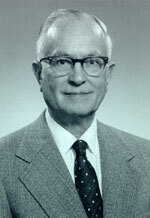 By the spring of 1948, Pauling learned as he talked to the British protein researchers, the helix was a popular candidate for the keratin structure. But no one had figured out how amino acids could fit together into a helical structure that matched Astbury's 510-picometer repeat. That was the state of affairs when Pauling did what turned out to be one of the best things he could have possibly done: He got sick. See Also: Letter from Linus Pauling to George Beadle. January 31, 1948. See Also: Letter from Linus Pauling to Robert Corey. February 3, 1948. See Also: Letter from Linus Pauling to Carl Niemann. February 18, 1948. See Also: Letter from Linus Pauling to Robert Corey. March 3, 1948. See Also: Letter from Linus Pauling to Carl Niemann. April 1, 1948. 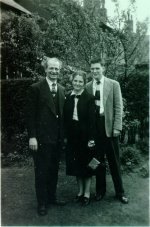 Linus, Ava Helen and Peter Pauling. Manchester, England. April 1948.